Amir Tataloo, Iranian musician is till in jail after his second arrest on 23 Aug 2016 by Islamic Republic authorities without any clear announcements regarding the charges against him. Sources linked to Tataloo have reported in their social media posts that the charge against him is “spreading corruption and indecency”. The reports add that he has been subjected to psychological tests and it is not clear how long he will be held in custody. Amir Maghsoodloo who goes by the artistic name of Amir Tataloo, is a popular Iranian R&B musician whose artistic activities and personal life have become the subject of much controversy in Iran. His buff appearance and tattooed body along with his lyrics about his daily experiences have repeatedly put him under the microscope. He has been highly criticized for expressions of loyalty to the system and Iran’s leader Ayatollah Khamenei. His support for Iran’s right to develop nuclear capabilities has also raised many eyebrows. He has been accused of hypocrisy for his emphasis on religious concepts as a means of getting distribution permits for his music. Why is an artist like Tataloo being accused of hypocrisy and why, despite his adherence to certain values dictated by the establishment, is he being persecuted by the authorities? Ali Peyvandi, Iranian Paris-based sociologist explains that hypocrisy is a learned characteristic shaped by specific social circumstances. He further adds that restricting artists and famous cultural figures in a country like Iran where the media is under strict control of the state has always been a chief policy of the Islamic Republic. Mostly because the public reach of celebrities is considered as a threat to the system’s political security. Iran’s political and social situation gives a political layer of significance to the statements and actions of all celebrities turning their public lives into an arena of constant battle between government supporters and the opposition. Thus some celebrities receive the mark of champions and others that of opportunists. Amir Tataloo is often given the title of opportunist and hypocrite. Religion, whether a personal choice or a strategy for self preservation, has a prominent place in Amir Tataloo’s music and daily life. Tataloo collaborators have released his new song “Imam Reza” while the artist is in custody. This has further irked Tataloo’s detractors who say he is using religion as a tool and lacks integrity. Tataloo has also been accused of being apolitical. This kind of accusation is often from left wing intelligentsia and cultural elite who often have little regard for popular culture. Is it fair to demand pop artists to take a political stance and accuse them of hypocrisy when they do not? Artists that work inside Iran are faced with such restrictions that might appear absurd to the eye of their observers from the outside. Recently Chartar Music Ensemble asked its fans after a concert abroad to put on a headscarf if they wanted to take souvenir photos with them. The news exploded in social media with cries of condemnation. 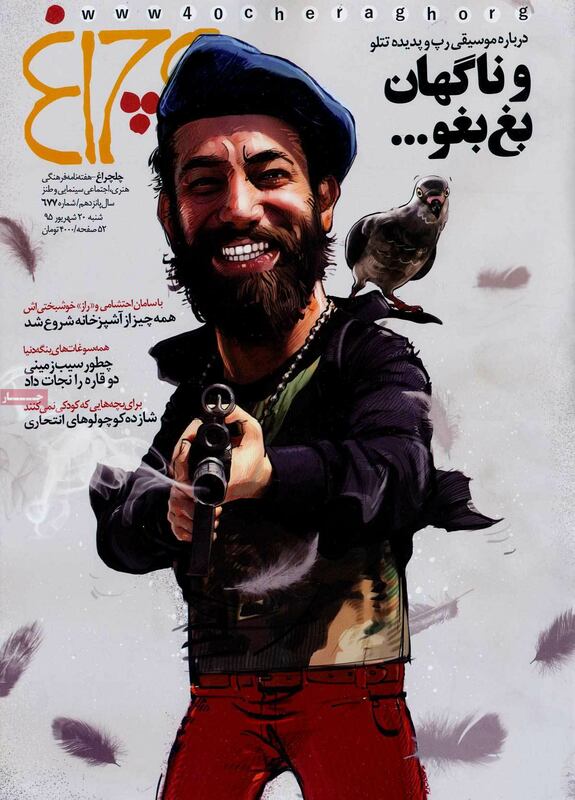 The day to day survival of Iranian celebrities inside Iran is a complex arena of infinite contradictions and conflict between different social groups. Mostly, none of the public demands laid upon them can be reconciled with their social reality of these celebrities. They walk a thin line between fame and notoriety in constant threat of losing all credibility.